Carillion’s collapse, throwing thousands of workers into job and pension insecurity, is a watershed moment in the privatisation fiasco. It’s becoming clear to many people who may once have been taken in by claims of the greater efficiency of private companies that a totally new approach needs to be taken to the provision of public services. Some of Carillion’s workforce are PCS members working on contracts in civil service offices. The jobs of our members employed by Carillion in the courts service, prisons, the British Museum, the Met Police, the Registers of Scotland and elsewhere have been put at risk. I wrote immediately to the cabinet office minister calling for those jobs to be brought in-house and for the government to call a moratorium on all future and planned outsourcing. It’s of great concern, but perhaps not surprising, that he has not yet replied to that letter. Putting profit before vital public services and workers is nothing new. We have seen privateers walk away from failing contracts in many parts of our public services and the taxpayer having to pick up the mess they leave behind. Private companies like Serco, Interserve and Carillion hoovered up public sector contracts and in turn reduced the terms and conditions of staff. These were jobs previously done by civil servants, local government workers and NHS staff. Corners were cut in a bid to improve the profits, complaints rose and, in some cases, the contracts had to be taken back in-house. The mess often caused by privatisation has affected some of the most vulnerable in society. In the civil service, where PCS is the largest union, the government had to take back a contract for some HMRC tax credits work from private company Concentrix after a huge level of complaints about wrong payments and delays led to regular questions being asked in Parliament. The government removed the contract from Concentrix and returned the work to HMRC from where it should never have been outsourced in the first place. PCS members told us of the hostile anti-union atmosphere created by Concentrix who had resisted every attempt to allow PCS to recruit and organise in the Belfast office. It’s become clear privatisation doesn’t work for the British people. Carillion’s collapse exposes to the world the falsity of claims of greater efficiency in the private sector. According to a recent report in The Guardian, some PFI contracts cost 40 per cent more than would have been the case had they been funded directly by public spending, and taxpayers will pay nearly £200bn to contractors under PFI deals for at least 25 years. Privatisation is a corrupt process where a merry-go-round of sham bidding and the awarding of contracts, false accounting and political sleight of hand shunts money from the public purse to big company executives and shareholders. We desperately need a new approach. So, after many years in which New Labour governments were enthusiastic advocates of PFI, it’s been encouraging that the current Labour frontbench convened a meeting of the key trade unions who represent Carillion staff and were able to seek a dialogue about the situation on the ground. This open approach and willingness to work with the trade unions is extremely welcome. The contrast to the government failing to even reply to letters could not be starker. The recent statements about the new approach Labour would take in government to PFI and privatisation have the full support of PCS. Our members deserve nothing less. It’s time to end the fiasco that is privatisation. 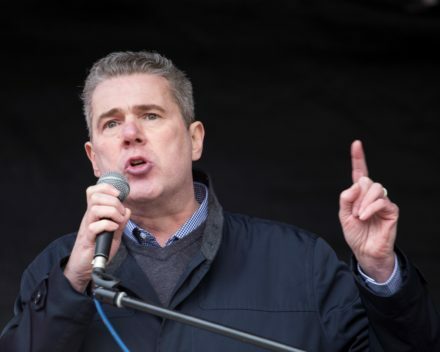 Mark Serwotka is general secretary of the civil service union PCS.